This cathedral is situated in Nevsky Prospect. It was built between 1801 and 1811 after the design of the ar­chitect Andrey Voronikhin. On the site of the present cathedral in the 18th cen­tury there was a church of the Nativity of the Mother of God. That stone church was built between 1733 and 1737. The architect Mikhail Zemtsov designed that church. The ancient Kazan Icon of the Mother of God was kept in that church. This miracle-working icon was the protector of the House of the Romanovs. At the end of the 18th century it was decided to build a magnificent cathedral. Paul I wanted it to resemble St Peter’s Cathedral in Rome. The competition for the de­sign of the new cathedral was announced. Many famous architects took part in it. The design of the cathedral made by Andrey Voronikhin was approved in 1800. The architect designed this cathedral in the traditions of Rus­sian classicism. Though it looks like St Peter’s Cathedral in Rome it has the shape of a Latin cross which stretches from west to east. The cathedral was consecrated on the 15th of Septem­ber 1811. The Kazan Cathedral strikes by its rich decor, magnificence and huge forms. The monumental colonnade of Kazan Cathedral con­sists of 96 Corinthian columns in 4 rows. Each column is 12.37 metres high. The columns are faced with the light yellow Pudozh stone and decorated with vertical troughs.On the top of the columns there is a balustrade. The ca­thedral is embellished with six-column porticoes with triangular frontons. On these frontons there is a bas-relief depicting one of the Biblical subjects “The All-Seeing Eye”. The dome of the cathedral is light and proportionate. It towers above the colonnade. The outer casing of the dome is made of forged iron. It has a metal base in the form of radially diverging ribs. The bas-reliefs and sculptures made by the best Rus­sian sculptors were used in the decoration of the cathe­dral. Such outstanding masters as Ivan Martos, Ivan Prokofiev, Stepan Pimenov, Vasily Demut-Malinovsky, Vladimir Borovikovsky, Orest Kiprensky and others took part in the creation of the interior and exterior decora­tion of the Kazan Cathedral. The best materials were used during the construction of the cathedral such as porphy­ry, bronze, multicoloured marble and so on. Inside the cathedral is divided into three parts by rows of granite columns. The iconostasis was made in the 1830s according to the drawings of the architect Konstantin Ton. One of the best decorations of the cathedral is its cen­tral entrance door. It has an interesting story. In 1442 the Italian sculptor Lorenzo Giberti decorated the Baptistery of Florence by wonderful doors. It took him 27 years to create this masterpiece. When Michelangelo saw them he exclaimed that they were beautiful enough to serve as the gates to paradise. Since that time this work of Giberti is known as “The Gates to Paradise”. Now the bronze copy of those doors decorates the northern portico of the Kazan Cathedral. The plaster models of the doors are preserved in St Petersburg in the Academy of Fine Arts. The doors’ decorations consist of the compositions taken from the Bible. The architect of the ca­thedral Andrey Voronikhin invited the best founder of Russia Vasily Yekimov for casting of these doors. In 1929 the Kazan Cathedral was closed. From 1932 it housed the Museum of the History of Religion and Athe­ism. At the end of the 20th century the exhibits of the museum were transferred to another building. 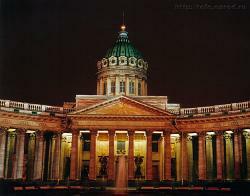 Since 1999 the services are held in the Kazan Cathedral.